Thus far, little effort has been made to analyse data from the private sector’s R&D and innovation grant applications, both at national and regional levels. This data provides bottom-up information about new emerging businesses and technology trends as perceived by the private sector. Many R&D and innovation grants require matching funds from the private sector, and hence this information is more credible regarding business interests and trends than official declarations. In the context of the smart specialisation process and entrepreneurial discovery, Innovation Maps (IMs) have been used to help tease out information about technological trends by the private sector. They are considered as new ways to collect and analyse data from R&D and innovation grant applications to identify emerging areas of business and technological strengths. Innovation Maps were used as an essential part of the Entrepreneurial Discovery Process (EDP) in Poland, particularly within the pilot project on the EDP and business needs analysis conducted by the World Bank (2015). They were used to identify key priorities for business innovation spending. In general terms, an Innovation Map is a method that enables acquiring a better understanding of the process of innovation, assisting in the development of new tools to measure innovation-related phenomena and to articulate innovation plans (Mahdjoubi, 1997). The method is one that has not been widely used in EU regions/countries. In the context of the RIS3 development process, Innovation Maps have been used in Poland to help understand technological trends within the private sector using data on grant applications. Data collection. Data on grant applications should be collected. If several Ministries, agencies or stakeholders are involved in the funding of innovation and R&D support programmes, then there is a need for joint collection of this data into a single database. Data cleaning. Classification of support applications based on existing classifications (e.g. Nomenclature for the Analysis and Comparison of Scientific Programmes and Budgets -NABS 2007) (1). Extraction of data from the applications into: applicant type (company vs. academia/research); application status (approved vs. declined); geographic division (regions); other. Data analysis. The objective is to create maps built along a business/technology matrix, combining the business area of a grant application (this is likely to vary per region or country), with a technological classification (e.g. NABS 2007), to identify business and technology trends and new areas of competitive strengths based on revealed preferences of the private sector. Heatmaps and charts are produced to show the concentration of the number of applications into regions, business areas and technology areas, as well as various other classifications. The following Figure 14 presents an Innovation Map for the Dolnoslaskie region (PL) based on “fast track” applications to the Polish National Centre for Research and Development (NCBR). Policy intelligence. When grant application data is collected over several years, the innovation maps’ results can be compared to other exercises such as technological foresight results. They can also be benchmarked against smart specialisation priorities and analysed within specific groups to evaluate fitness of prioritised specialisation areas, etc. When implemented at a national level, they can help identify regional strengths and concentrations of innovation activities. The collection of grant data from grant applications submitted to public innovation support institutions is a prerequisite for producing an Innovation Map. This requires the existence of a database of grant applications, and preferably an online, standardised and automated system for submitting grant applications that allows data mining, to automate the retrieval and analysis of this data. This is however not a normal practice in the EU. An example of an automated grant application system at EU level is the Horizon2020 Participant portal. The portal is the single entry point for the submission of EU-funded grant applications. Linked to the portal, the European Commission manages the Community Research and Development Information Service (CORDIS), which includes a Projects and Results service. 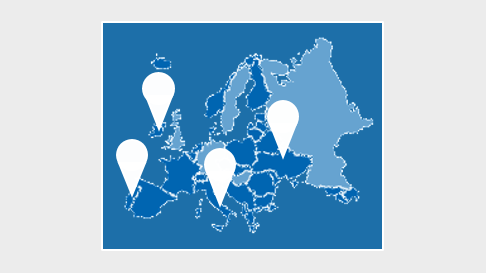 This service is a one-stop shop for information on EU-funded research projects and project results. It includes information in the lifecycle of each project: the grant details, funding and participants, the project’s own Report Summaries, the latest multilingual Results in Brief and links to specific publications and other documents. Programme data from FP5 to FP7 are included in CORDIS. It also includes data on grant holders from the private sector. However, this refers to research projects and not necessarily innovation projects. For the countries that collect innovation project data already (e.g. Finland, UK –see below), this would require adjusting/adapting the existing grant application systems to a standardised classification system of business areas and technology areas (e.g. 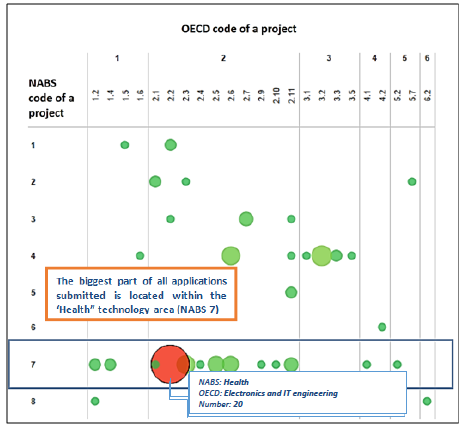 NABS and OECD classification as was the case of the Poland in the World Bank study). A standardised approach to data would help create innovation maps at regional, national and EU levels based on information from all relevant public support instruments, including specifically flagship matching grant programmes. If the implementation were to be enacted at the EU level, it would require the collection of grant data for all regions and from all funders and donors at EU level. Data could be collected or mined using automated systems following the submission of grant applications. Compliance to the fundamental requirements of the open data paradigm would be also necessary. The main source of data for the implementation of this method is grant application data. Tools for tracking data on projects and initiatives that are publicly funded are not widely used in the EU. Good practices in this regard include the open data storehouse of Tekes in Finland, which allows to search for projects and beneficiaries that have been funded through Tekes programmes. The Tekes database allows searches by organisation type (private sector companies; research organisations and others); by project status; Tekes programme and research type. The database allows searches by economic sector. Technology areas are not defined in the database, although some of them are described in the project’s abstract. The geographical area/locality of the grant holders are also identifiable. Probably the most developed grant dataset in the EU is the Gateway to Research database of the UK. The dataset provides information about publications, people, organisations and outcomes related to research projects. It includes information about the project such as abstract, duration, the amount awarded, the researchers involved and a list of publications produced. The data is collected from a range of systems used by the funding organisations to collect information from researchers, including the Joint Electronic Submissions system (Je-S) and ResearchFish. Gateway to Research (GtR) publishes information from a variety of source systems. The information is not transferred to GtR on a real-time basis and the information is processed against a set of business rules to determine suitability for publication. The dataset is currently static, or a simple snapshot of other databases and is not being updated regularly. However, the infrastructure is being built to refresh all the data in the website on a regular basis. This will enable consistency for future data access and further analysis. The database does not distinguish technology areas or economic areas. However, abstracts for projects are provided, as well as organisations descriptions. Private sector companies are also distinguished. Ongoing studies on open data on the use of EU Structural Funds have shown that most data currently published by the EU national and regional authorities are not compatible yet with some of the fundamental requirements of the open data paradigm. Data is rarely complete, accessible, timely, machine-processable and non-proprietary. Open data on public support would allow for tracking of project themes and topics, and assessment of how they match with S3. This kind of data could be highly valuable in tracking progress towards objectives and vision, but also in informing the RIS3 update. InstantAtlas (http://www.instantatlas.com) is a data visualisation tool that provides interactive graphs and maps based on statistical data. It is widely used by government organisations at regional and local level in the UK, including the Greater London Authority, the Bristol City Council, the Brighton and Hove Local Information Service (data sharing and needs assessment) and the Devon County Council. It has been also used by the Bavarian State Office for Health and Food Safety to provide regional data about the health situation of the population of Bavaria using interactive maps on, for instance, the geographic patterns of mortality, illnesses, risk factors and care indicators. Raw (http://raw.densitydesign.org) is a web application for vector graphics (similar graphics as the ones produced by the World Bank for the Polish EDP study). The app is developed and maintained at the DensityDesignLab of the Polictecnico di Milano. It focuses on the visual representation of complex, social, organisation and urban phenomena, and aims to exploit the potential of information visualisation and information design in order to provide innovative and engaging visual tools that enable stakeholders to build solid arguments. Two implementation Roadmaps could be foreseen: one for regions/countries that already have open access data on innovation grants (1); and a second for those that do not (2). Prior to the implementation Roadmap it could be foreseen to first map among EU regions/countries, those which already collect data on innovation grants systematically (1) and those that do so following the principles of open data (2) (Step 0). Two of the most known open access datasets on innovation grants are presented in the relevant data sources section above. Collection of grant data of innovation programmes, including publishing the results systematically. Definition of a method of classification, by business areas and technology areas. The use of standard classifications is encouraged to allow for cross-regional and cross-country comparisons. Consensus/agreement of a classification method at EU would be ideal and allow for cross-country EU-wide comparisons. Data cleaning and data classification. Each region/country would need to classify the grant data by technology area and business area. Data analysis and policy intelligence. Each region/country can make use of the data results to inform their smart specialisation process based on up-to-date bottom-up private sector data. Data openness. All data should be posted online for wide public distribution (e.g. posted on the respective websites or other dissemination/communication websites), including for the private sector’s use to help them guide their developmental visions. Innovation grant data could be made more granular by collecting more detailed information on the type of projects funded and technologies developed, as well as on the applicant. Create and implement an online grant application submission tool which allows presenting data in real time. This tool could request and indicate the key technology that the private sector wants to invest in and the key business area of declared investment. Develop synchronised databases for grant applications across regions/countries from different support institutions. World Bank (2015) Toward an innovative Poland: The entrepreneurial discovery process and business needs analysis, Washington, Report available at: http://documents.worldbank.org/curated/en/801221468186841613/pdf/106148-REPLACEMENT-v2-English-REPORT-Web.pdf.